This might seem strange, but I love grocery stores. I hate the actual act of grocery shopping. I hate having to find a parking spot, and I hate the fear I might run into a long, lost classmate and be forced to talk. But I love the store itself. The cold swoosh of air in my face when I talk through the automatic doors. The smell of bakery items sometimes overtaken by rotisserie chickens. The fresh flowers for sale…. 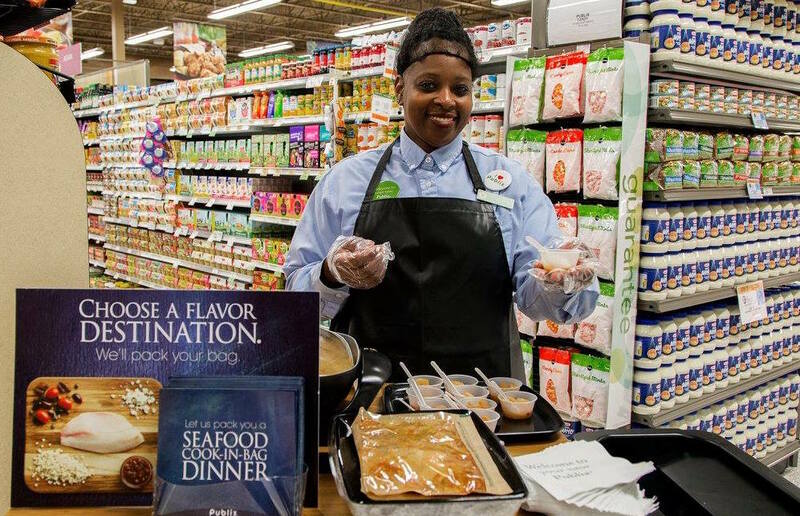 I also love the way (many) grocery stores treat their employees — with awesome benefits and opportunities for growth. We (myself and an intern) combed through a list of 30-plus large grocery store chains, both regional and national, and looked at the benefits they offer their employees. We boiled down the list to 10 stores that offer some of the best benefits. I know we have some huge Aldi fans out there. You can snag awesome deals at this national chain, but you can get even better benefits as an employee. Even if you don’t work full time, you can still get full health benefits if you work at least 25 hours. And even if you only work two hours per week, you can still set up a 401(k). For more details and to find job openings near you, visit Aldi’s career page. I’ve never actually been inside a Kroger. Does that make me a bad human? Probably. For more information and to find an opening near you, stop by Kroger’s career page. Midwestern charm at its finest. To find out more about Meijer and its career opportunities, visit the career page. As a Floridian, Publix is my jam. And if I’d known about its benefits — even for part-time employees — I would’ve been more likely to grab a gig in high school. And these lists aren’t even all-encompassing. For the complete lowdown, visit the Publix career page. Then stop by the bakery for some bread and a free cookie. Seriously… so good. Safeway is into the idea of enjoying today and planning for tomorrow; its motto for employees is “For today. For tomorrow”. Because of that mentality, its benefits are pretty comprehensive. However, the career page does note the benefits I’m about to list are for non-retail store employees (generally). If you work in the store, benefits vary by location. Even if you only work part time, you’re eligible for these benefits. If you’re interested, you’ll need to ask your store about the specifics. In the meantime, stop by Safeway’s career page. I didn’t realize just how many Save A Lots are out there — more than 1,300 stores in 36 states. Perhaps it’s thriving because it treats its employees so well. You can find the complete rundown and any job openings on its career page. Wakefern Food Corp. owns this chain, and the companies employ more than 50,000 people, according to its website. However, it’s only located in Connecticut, Delaware, Maryland, New Jersey, New York and Pennsylvania. Find more information and jobs on Wakefern’s career page. This franchise says it treats its employees like “bread and butter,” which sounds pretty darn good to me. For the complete list of TJ’s benefits as well as open jobs, you can visit its career page. This chain’s been around since 1915 and has grown from a single pushcart to 90 stores — and it’s still growing. It employs more than 45,000 people, and they’re treated well. Although you might not have heard of Wegman’s yet, it’s worth keeping an eye on as it expands. For all the details, visit the careers page. This is a bonus because Southeastern Grocers umbrellas four grocery stores: Bi-Lo, Harvey’s, Fresco y Más and Winn-Dixie. The careers page also mentions “a competitive benefits package to help achieve their health and wellness goals.” For more information and employment opportunities, check it out (without having to stand in line). OK, so you’re at the end of the list, but you’re wondering where Whole Foods Market is because you’ve definitely seen it before on one of those “Best 100 Companies to Work For” lists. You see, I wanted to add it to this list, but a lot of the store’s benefits are contingent upon service hours. So you have to work 800 hours to get low insurance premiums ($0-$20 per paycheck) and 6,000 hours (three years) to get stock options. Other stores made no mention of this. Also, you have to work more than 20 hours a week to qualify. No, Whole Foods isn’t completely down in the dumps when it comes to employee benefits, but it just couldn’t rival these others. And, for that, I’ll give it a hearty shout out instead. Your Turn: There are a whole lot of grocery stores in the States, and although we spent hours researching, we knew we’d miss some. So we know you’ll tell us: What are we missing? Kaitlyn Perta, The Penny Hoarder’s editorial fellow, sunk hours into researching grocery store benefits. Thanks to her, Carson didn’t completely lose her mind. For that, she gets a cookie (from Publix, of course).